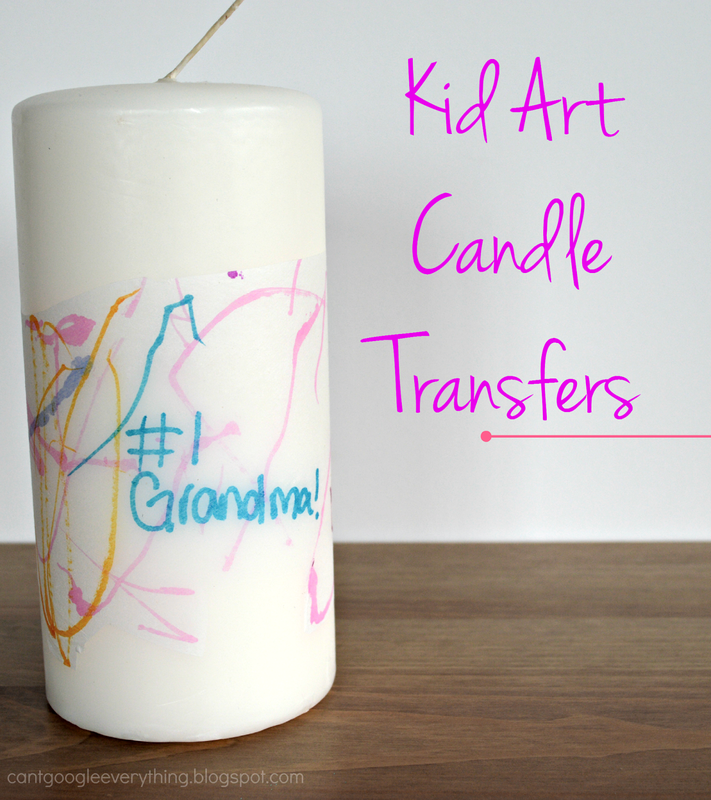 DIY Mother’s Day Gift: Kid Art Candle Transfers! Mother’s Day is coming up soon, and this year I wanted to get my mom something really special! My mom is very deserving and I honestly don’t tell her enough how thankful I am for everything she’s done for me! From always being there for my sister and me growing up, coming to all our games and meets, to offering to watch my son for a week so my husband and I can go on vacation, she really is a special and giving mom! Living far away from my mom means that she doesn’t always see the day-to-day things that we do. So I thought it would be nice to create a little treasure for her to share some of my son’s artwork- he loves to color and paint! I came up with the idea to preserve some of his artwork by transferring it to a candle for my mom to have as a keepsake! If you think you aren’t crafty, don’t worry, it’s very easy to do! tissues paper- we used American Greetings brand! 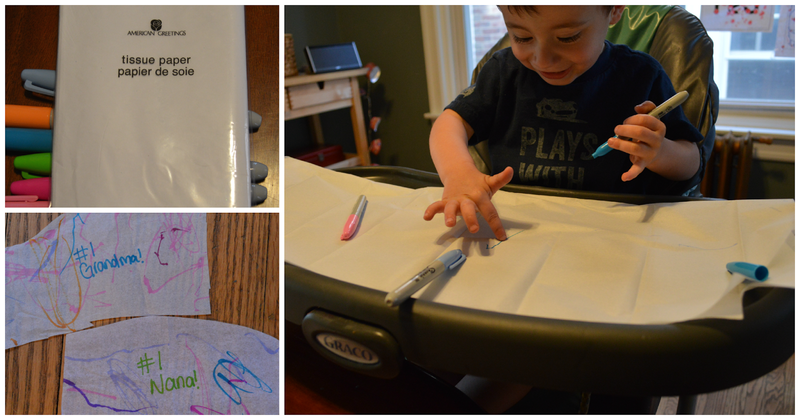 Have you kid(s) color on the tissue paper with the permanent markers. I told my son we were making some special for Grandma and Nana for Mother’s Day. I also told him these were special markers and special paper and he couldn’t write on his face with them! Be sure to protect your work surface because the markers will leak through the thin tissue paper. After the coloring is done, cut carefully around the artwork to size it down to fit the candle. Be sure to cut off as much tissue paper as possible, cutting close to the design. Next, place the tissue paper on the candle where you want to design to stay. Wrap the wax paper around the candle and hold it tightly in the back. Using a blow dryer on high heat, heat up the design until you see it begin to transfer. It takes about 45 seconds to a minute. You will be able to see the difference as the transfer starts to happen. 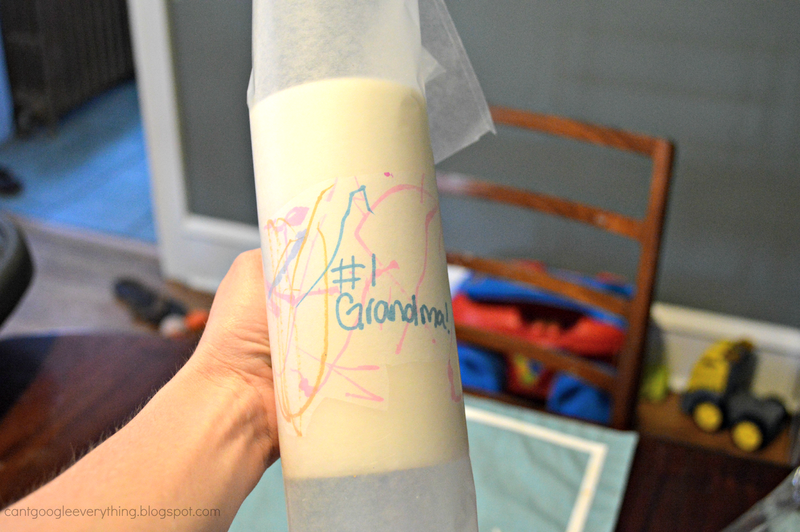 Carefully remove the wax paper and that’s it, your personalized candle is ready! Tip: be careful of your hands, because it gets very hot! Wear mittens if you’re sensitive! Wrap it all up! I am including a goody bag filled with candy, too! 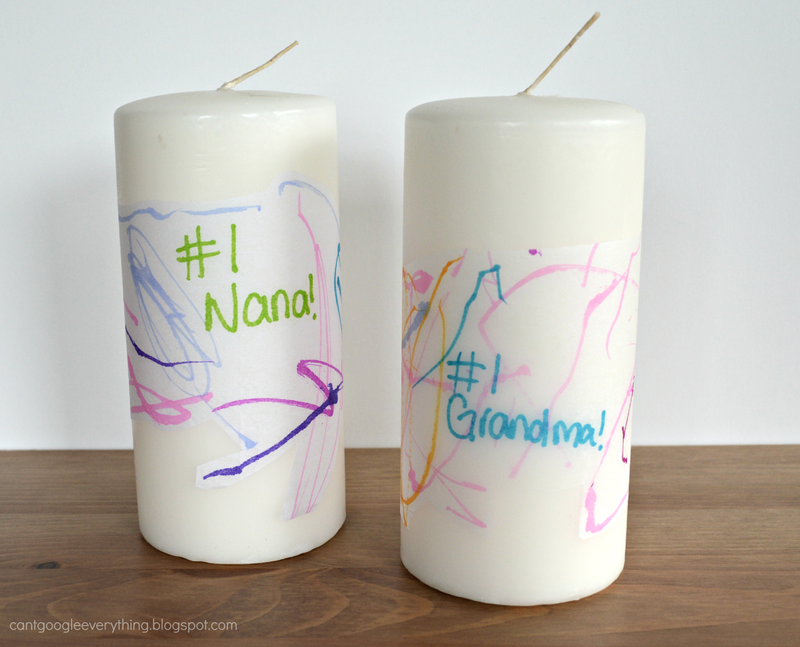 Don’t worry, we made a candle for Nana, too! 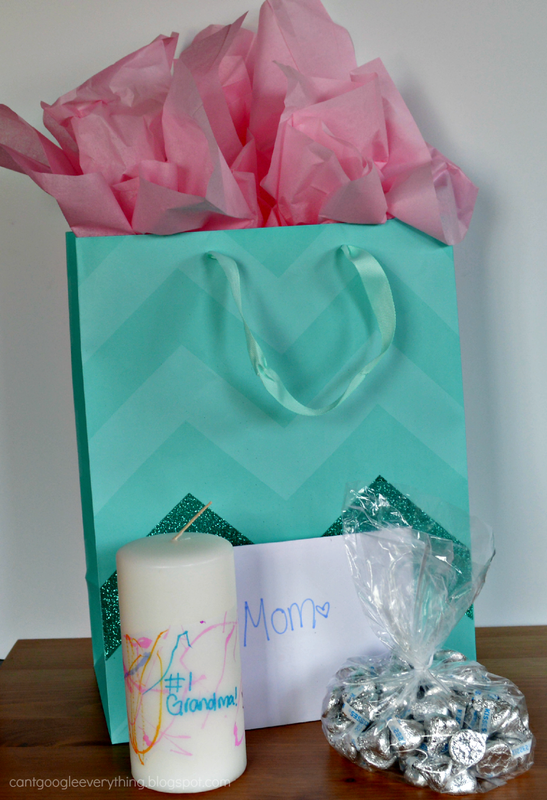 Thanks for checking out my candle craft for Mother’s Day! I’d love to hear from you in the comments, how do you plan to celebrate Mother’s Day this year? So cute! What a great idea for a Mother's Day gift! I love this idea! So cute and what a great (and easy) way to make a meaningful gift! Reading a comment below she says the tissue paper sticks to candle!! I was wondering same thing! This is such a great idea! I can definitely see my mom loving and displaying something like this when I have kids! I love this idea. It seems so simple yet creative and cute! What a fun idea! I think kiddo would enjoy making candles for the various moms in our lives. So simple to make too. These candles are so cute! I am definitely going to try and make some. Does the permanent marker come off the candles if you touch it or once the candles warm up? Thanks Shelly! The marker did not come off. What happens is that the whole thing is transferred to the candle (including the tissue paper) so the drawing is still on the tissue paper technically and stuck to the candle using the wax from the candle and the heated up wax paper. As a grandmother, I would love to receive this candle!! Such an easy craft and just so clever!! This is such a great idea! I bet your little guy had a blast making these. Love homemade things for the grandparents!